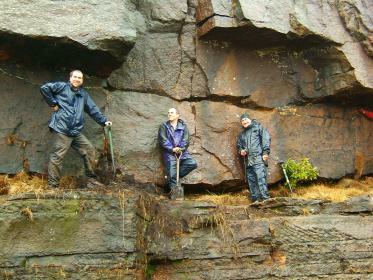 The Crag Station is supporting a series of crag restoration days over the winter, with the grand aim of getting some of the local crags into a better state for 2013. The first of these days is at Upperwood Quarry on Sunday 11th November and will be co-ordinated by Martin Kocsis, and in conjunction with the BMC. Meet at the shop from 10am , where there will be free brews and lifts to the quarry between 10.30am and 11am. The shop has some communal tools to lend out, but if you have your own, please bring them too. You will need waterproofs, a helmet, gloves, tools (e.g. spades, forks, trowels, patio knives) as well as abseiling kit, and some decent butties to keep you going. The Crag Station will be supplying tea and cakes throughout the day up at the crag to keep us all as happy and enthusiastic as these 3 chaps! Everyone is welcome, and if you have any questions, please contact us via the shop, by phone or email.